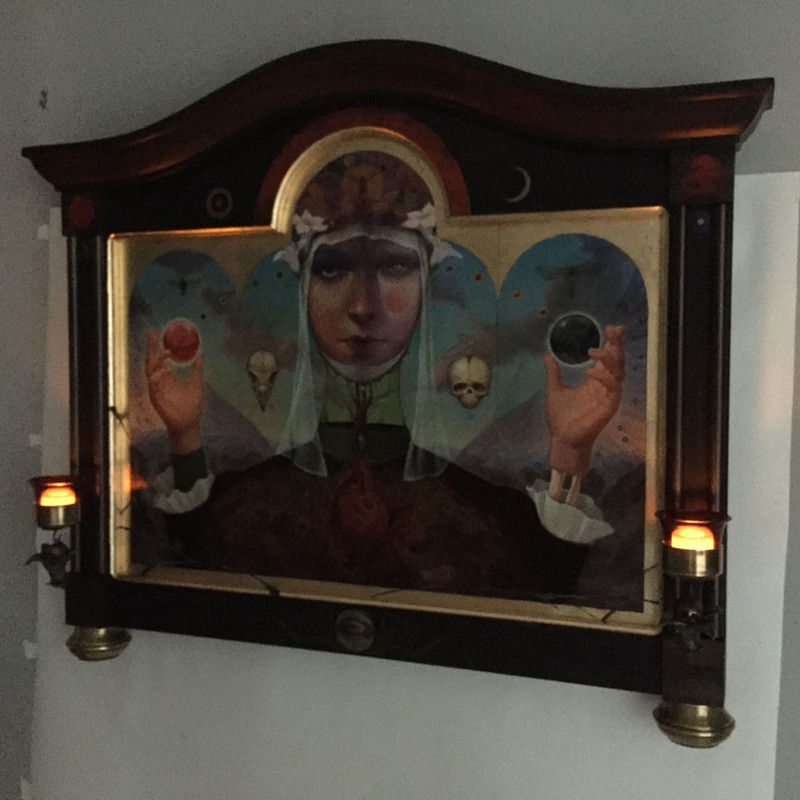 “Genesis Shrine” 27.5x32.5” Acrylic on panel, wood frame, polymer clay, brass, steel, composition gold leaf, votive glass candle holders. This piece is one that’s been kicking around in the back of my mind for quite awhile now. The idea was to create a painting that would depict the creation myth of the lost civilization of Dankquart Collection fame. It’s this culture’s attempt at leaving a visual record that would communicate to its people their belief’s about how the world came to be. 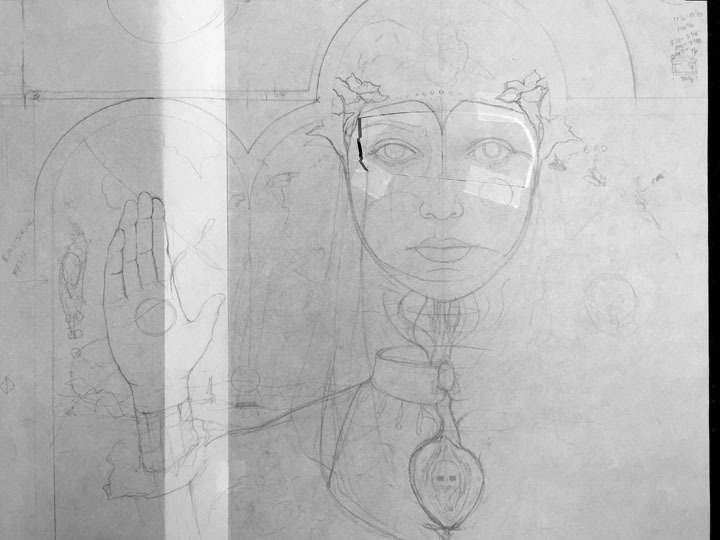 I drew up the basic sketch for the painting first and after doing some initial sketchbook designs exploring various design options for the frame, I did a smaller, “finished” pencil. The pencil would serve as a guide although it was really more a suggestion of where I planned to go with content elements as opposed to a full rendering. 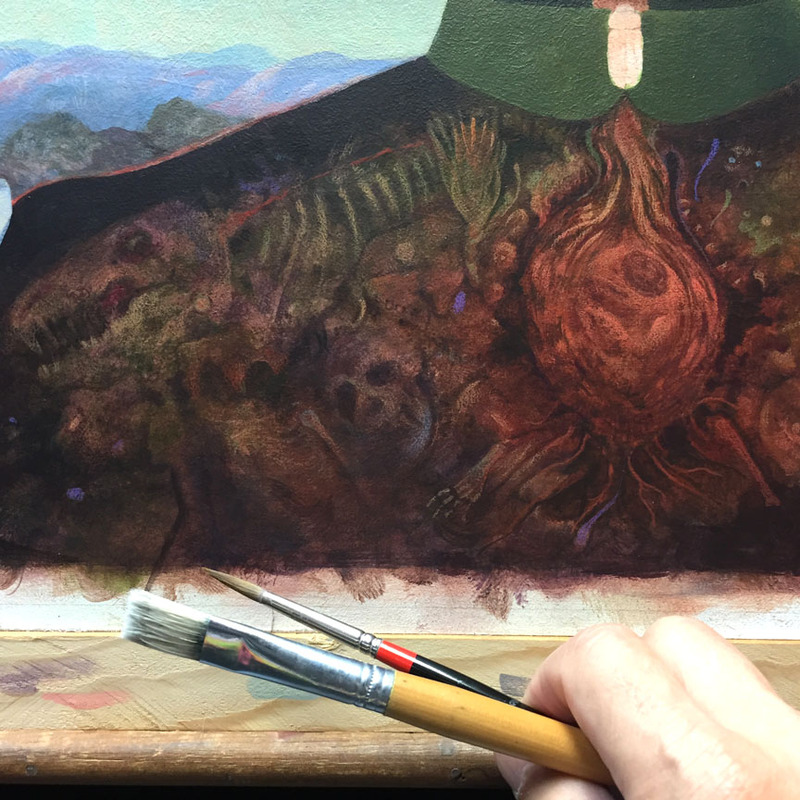 Much of the detail work is executed in the final painting from ideas I have in mind that don’t get locked in at the drawing stage. The drawing does give me the proportional relationship of the main compositional elements. I also planned to use a large, curved, wooden piece of trim from a piece of discarded furniture, in this case an old baby crib. That’s it running along the top of the frame. So I began working backward, or maybe sideways, since it was a matter of building the frame while at the same time making sure to allow for the proper proportional opening for the painting to fit into. Once I had the frame face and painting panel size and shape worked out I did my usual painting panel prep, first sealing with GAC 100 and then gessoing. 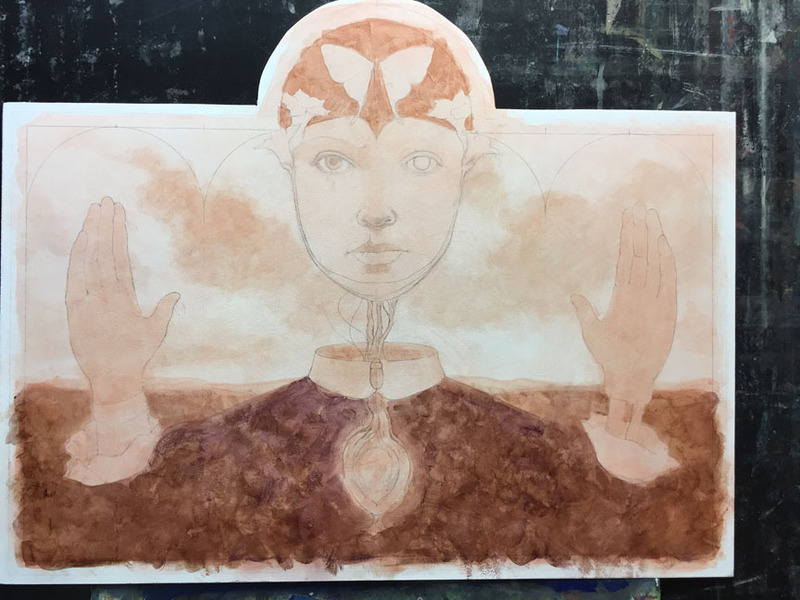 The painting’s design was transferred to the panel and I began a monotone underpainting to establish basic values. In between painting sessions I often work on the frame. That way the frame can be glued and set aside to let the glue cure as I go back to painting. Less time wasted. I routed the face frame so the painting would be able to “drop in” then routed the cove on the front side. The recycled crib also yielded the half round moldings running vertically on the frame sides. They were cut from the crib’s “jail bar” slats. Having extra depth on the frame sides gives it a more substantial, architectural look, so side pieces were added. As I continued to work on the painting I had to do some planning knowing that the areas of transparent fabric, the neck and veil for example, would have to be done in the correct order. It’s much easier to paint say the branches and tendrils of the neck area first, then glaze the green transparent neck material over the top. I also had to get the background set the way I wanted before the wings could be painted transparently. Not difficult, just requires some thought and planning so that things proceed in the right order. The area atop the figure’s head and her body were both painted very loosely with thin acrylic. Working this way I get little indications or suggestions that can then be developed into skulls, bones, etc. It’s always fun discovering all of the things that you never knew existed, right before your eyes. All the little design elements were added last, the tadpoles, arcs, geometrics, etc. Some of these were kept very subtle, others stand out. After working on the figure’s hands for a while I realized they were just not working. Out they went with a coat of “sky color”. A new hand pose was worked out, transferred down on the board and repainted. 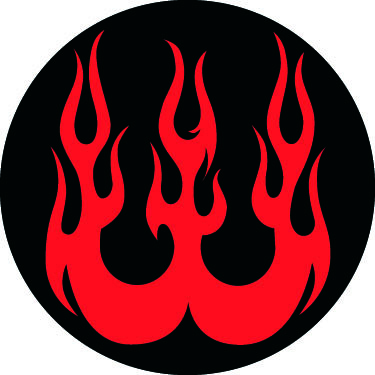 Compare the initial block in photo with the photo above to see the change. Much better. Although exaggerated due to the raking light in this photo you get an idea of the texture I create on the panel at the prep/gesso stage. 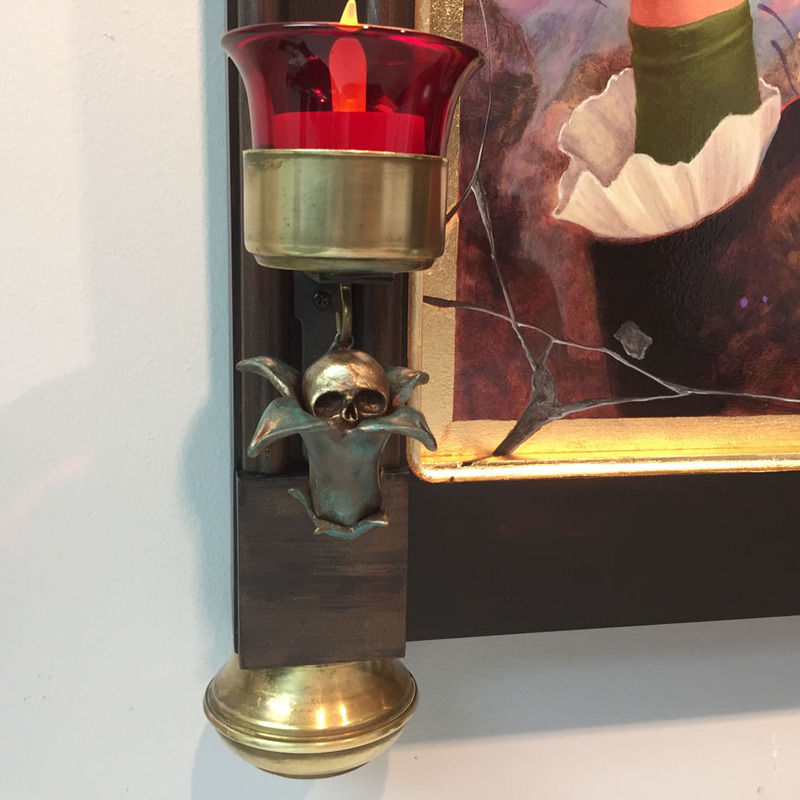 My original idea was to have some small sconce type candle holders mounted on the sides of the frame, but as the work developed it became obvious that that was not a good solution in this case. As I was kicking around alternative designs a dusty memory surfaced of the old church we attended when I was a kid. On either side of the altar were statues, one side Mary, the other Joseph. In front of each were tiered votive candle holders made of brass. That gave me an idea. A trip through my pile of discarded brass pieces, (from an old brass bed), yielded an end cap perfectly sized to hold a glass votive candle holder. I mounted that to a small bracket which fit on the frame’s side as if made for it. Nice when that happens. The candle brackets were finished off with hanging “skull in moonflower” polymer clay sculpts. 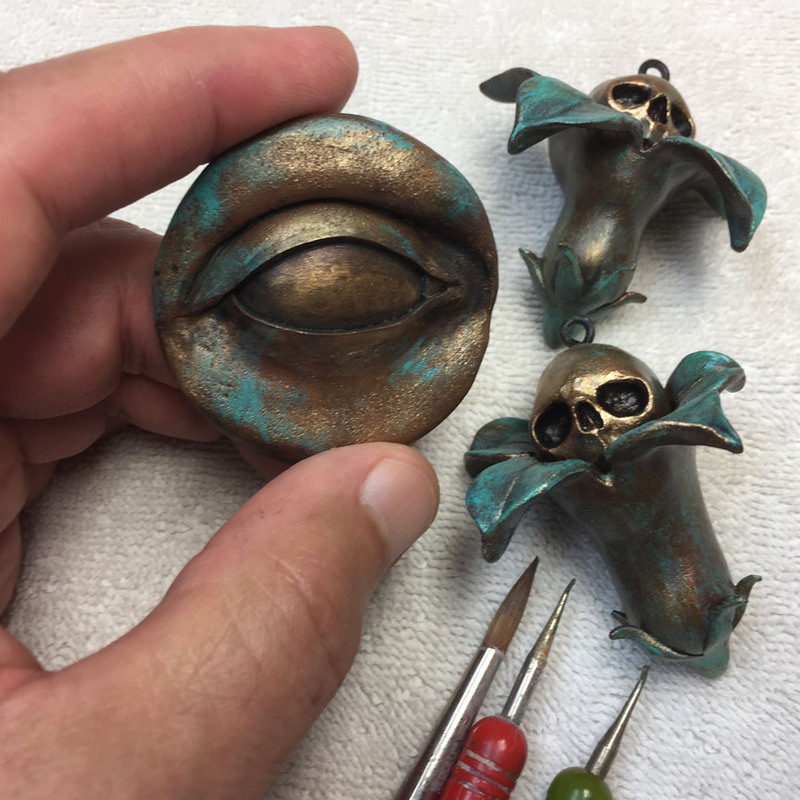 I created an eye ornament to mount at the bottom center of the frame and then painted all three pieces with a patinated bronze look. When the painting was complete I added the composition gold leaf border. There are a few areas of cracking and I left some “leaf loss” to indicate age. These cracks carry over from painting to the gold border on the frame opening. 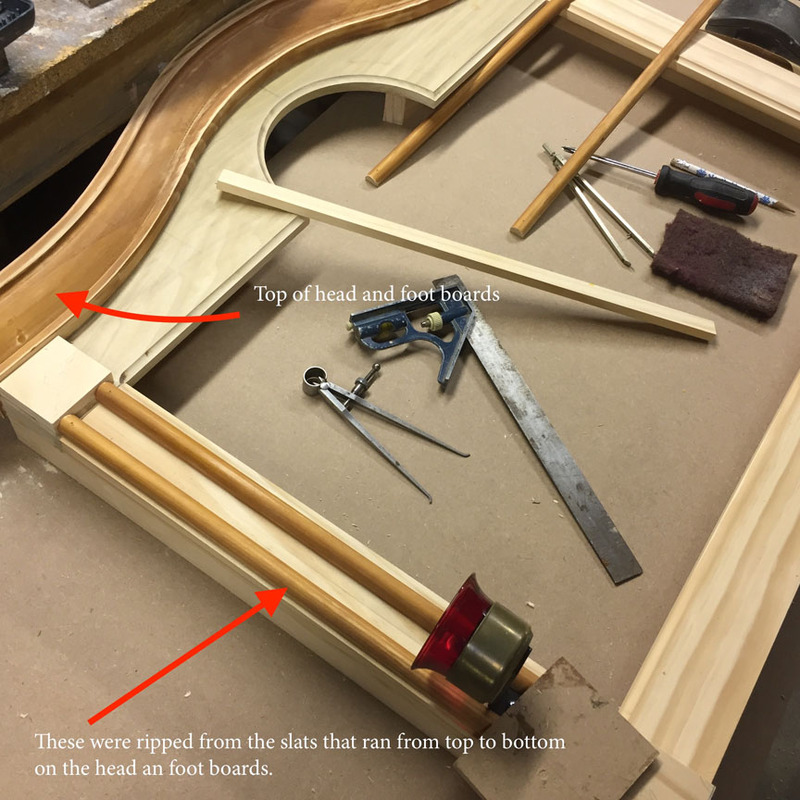 The frame’s finish was now applied. This is a multiple step process of sand, prime, sand, paint, glaze, sand back, etc using metallic and no metallic paints. Details and accents are added like the red circles and gold flourish surrounding the sculpted eye. 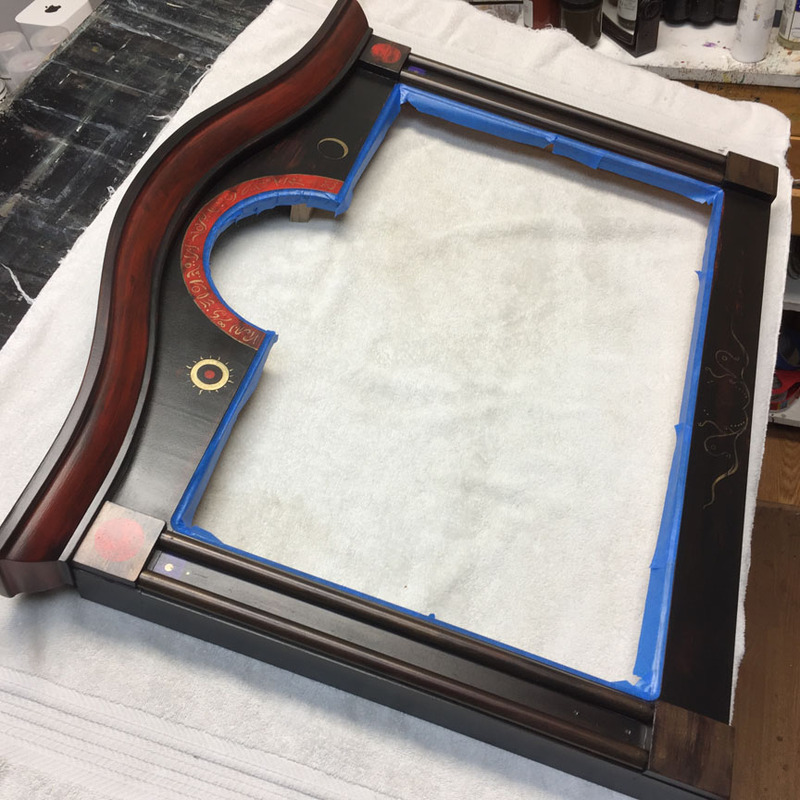 When the color and details are complete the frame gets a coat of varnish. The blue tape in the above photo is masking off the area that will be covered in gold leaf. When the varnish is dry the masking is removed and gold leaf is applied. The painting is mounted in the frame, hanging brackets and wire are installed, and then the final assembly can take place. The candle brackets are mounted and eye sculpt attached. Done! A shot of the shrine in dim studio light with the led candles lit. I like that. I have a few more shrines sketched out, just rough scribbles at this point, but I plan to further explore these ideas further in the coming months. 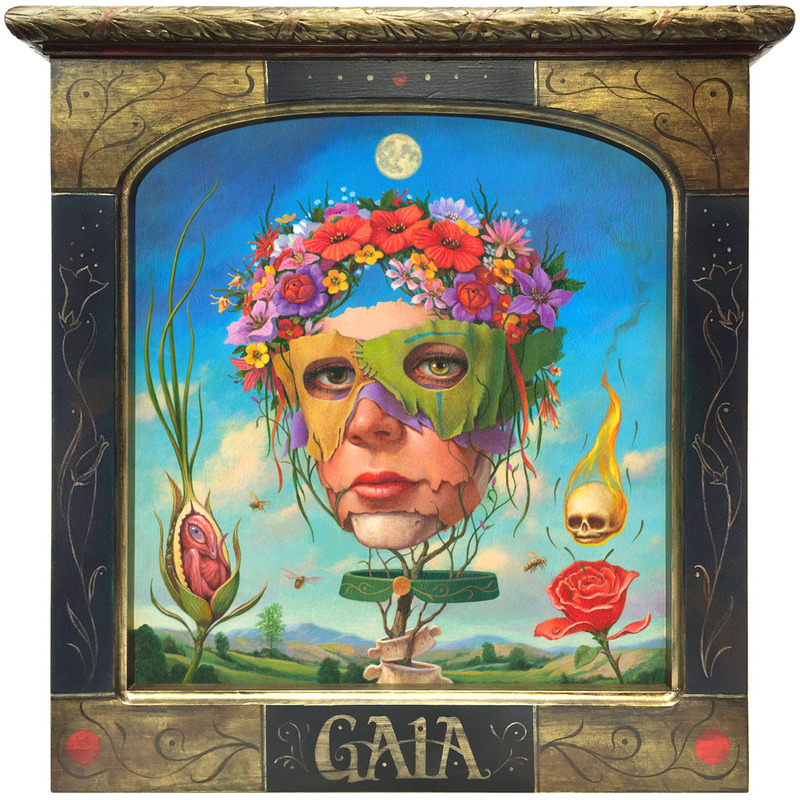 Gaia 12.5x11.5” (16x15.75” framed). Acrylic on panel, artist created wood frame. The Summer of Love, 1967. Hippies, psychedelia, great music, “happenings” and flower power. And the epicenter of this social movement in America was the Haight-Ashbury district of San Francisco. 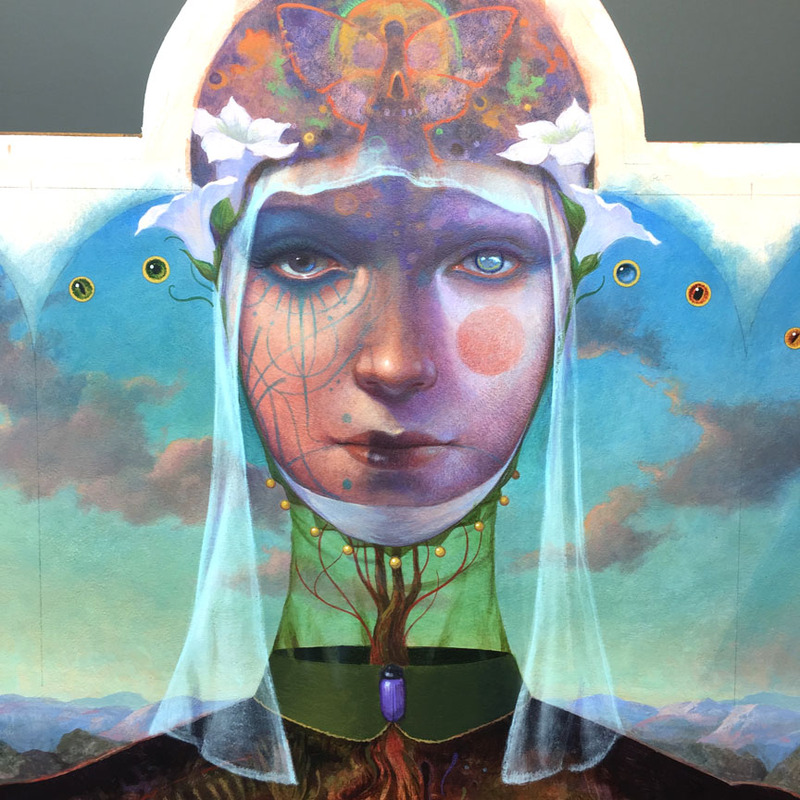 To commemorate the 50th anniversary of the Summer of Love the city of San Francisco is celebrating with a series of events including Modern Eden Gallery’s group exhibition, “Flower Child”. I’m a huge fan of the era’s music and art and thrilled to be participating in the show. 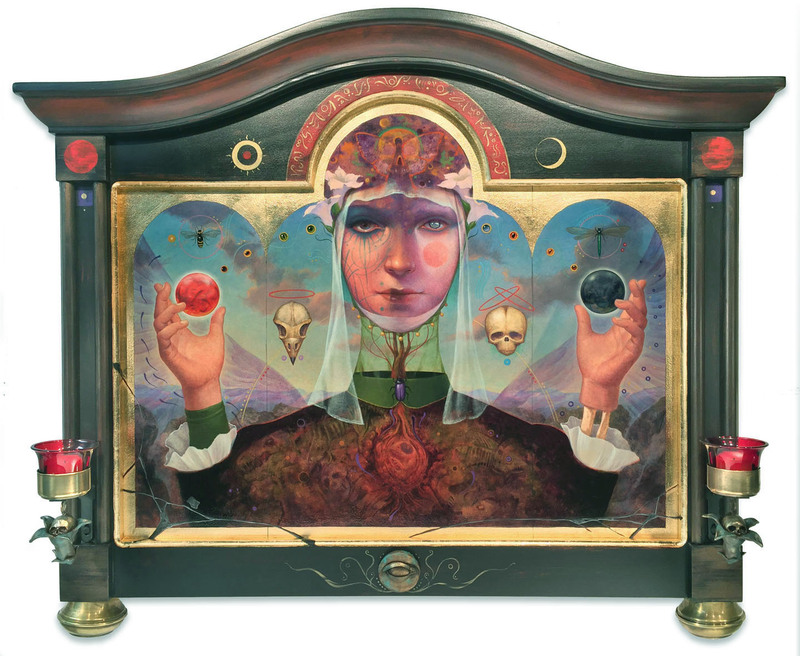 My contribution is, “Gaia”, an acrylic on panel painting with a custom created frame. The piece is a riff on one of my masked figures accompanied by my flaming skull and embryo characters, with a tinge of psychedelia for good measure. 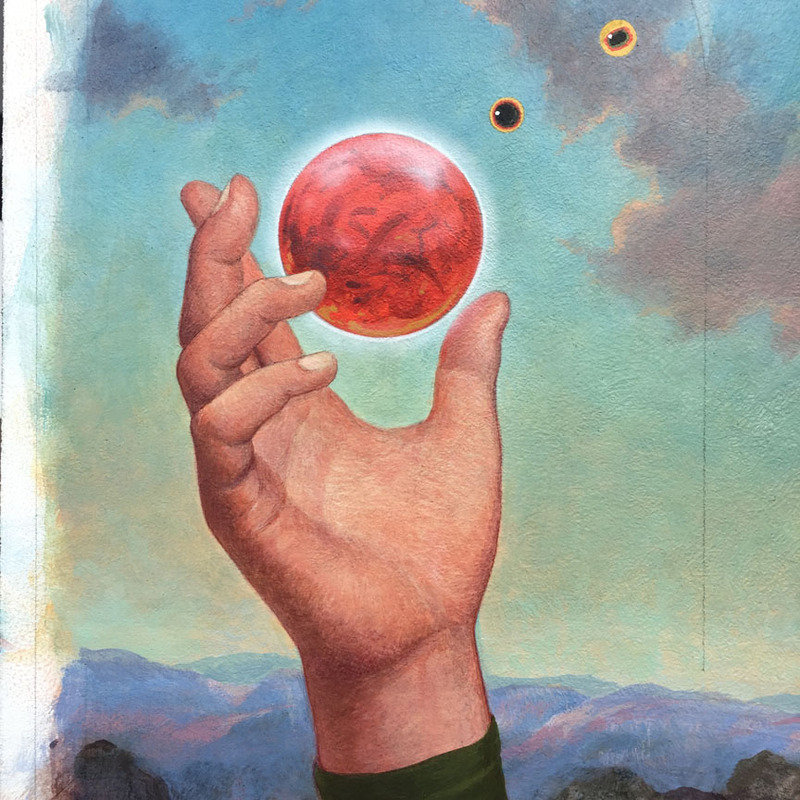 In fact the piece came from swirling thoughts of that era’s incredible album cover art, hence the squarish format. (How I would have loved to been able to work on one of those album cover commissions!) The lettering at the bottom is a tip of the hat to the incredible typographic treatments and hand drawn lettering that became so popular during the period. 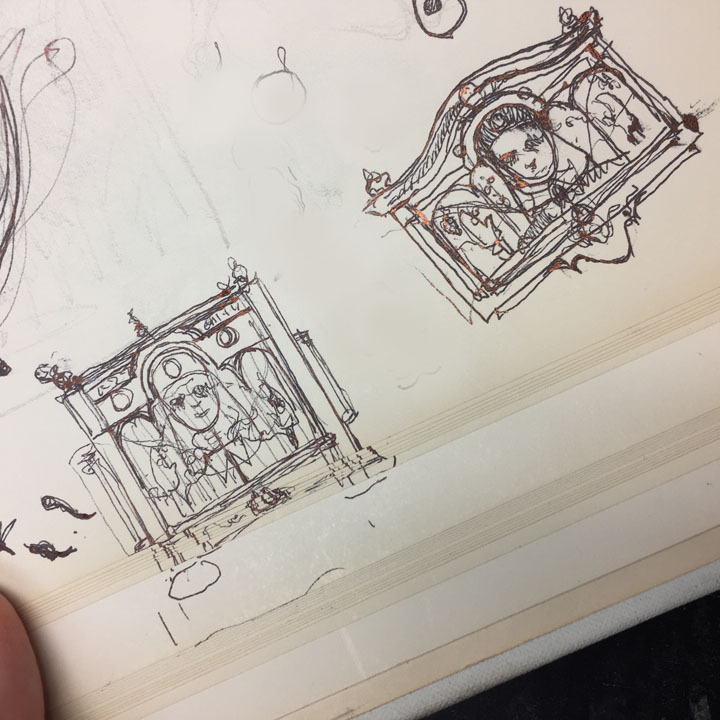 The embossed wood band running across the top of the frame was selected because it reminded me of one of those Painted Lady victorians in SF. A few floral style flourishes were added around the frame’s edges to tie the entire piece together. “Flower Child” opens at Modern Eden August 12 and runs through September 2, with an opening reception on the 12th from 6-9pm.